Tidur has always been something like a playground to try out new technologies. And with version 4.0 I’ve switched all of the syncing code from my syncing through my own server to CloudKit. Login and accounts are gone (since they are no longer needed), and syncing is now available to everyone. I wanted to get familiar with CloudKit before adding it to Fiery Feeds, and you can now simply turn on syncing instead of having to create an account – which is a vastly better experience. Additionally I’ve replaced the old hacked together Siri support with Siri Shortcuts. You can now record a phrase to start a specific timer, start timers from the Shortcuts app, and start suggested timers right from the lock or search screen (if iOS happens decides to suggest a timer). And it now includes visual feedback in Siri’s interface. You can find version 4.0 on the App Store. As a new year begins I want to pause for a moment and reflect on the past year’s accomplishments and to share a roadmap of the plans for the new year. 2018 was a big year for Fiery Feeds. Two major updates and its fifth birthday (it’s really been already 5 years since version 1.0, I can’t believe how fast that went). I’ve added a ton of new features this year, you can see them in the entire changelog, but I’m going to highlight the biggest features here. First there was the big 2.0 update, which completed the transition to a free app with a $9.99 per year subscription for additional features. The subscription is working really well, even if the first year isn’t up yet, and the yearly subscriptions not renewing yet. It’s almost as if letting users try the app first is a good thing. Maybe the biggest feature this year are the so called Smart Views. There is the Hot Links Smart View, which highlights the most linked to websites in your Feeds (a first in iOS RSS Readers), there are Smart Views based on the posting frequency, Smart Views for particularly long or short articles, a view for articles published today, and a specially highlighted Must Read folder, for the most important feeds. I’ve also brought the app up to speed with all of the new features in iOS that have been missing before 2.0. This included 3D Touch, Drag and Drop on iPad, Continuity to quickly open articles on other devices, Haptic Feedback and State Restoration. But the most important thing was cleaning up the code base and bringing it to a state, I can build upon for the next few years. 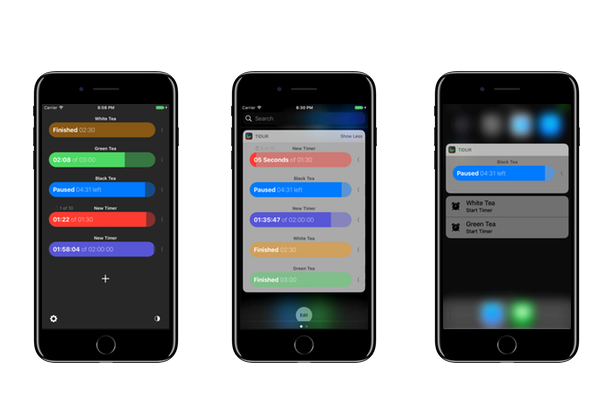 This allowed features link 3D Touch or the new layout, and some of the coming features. 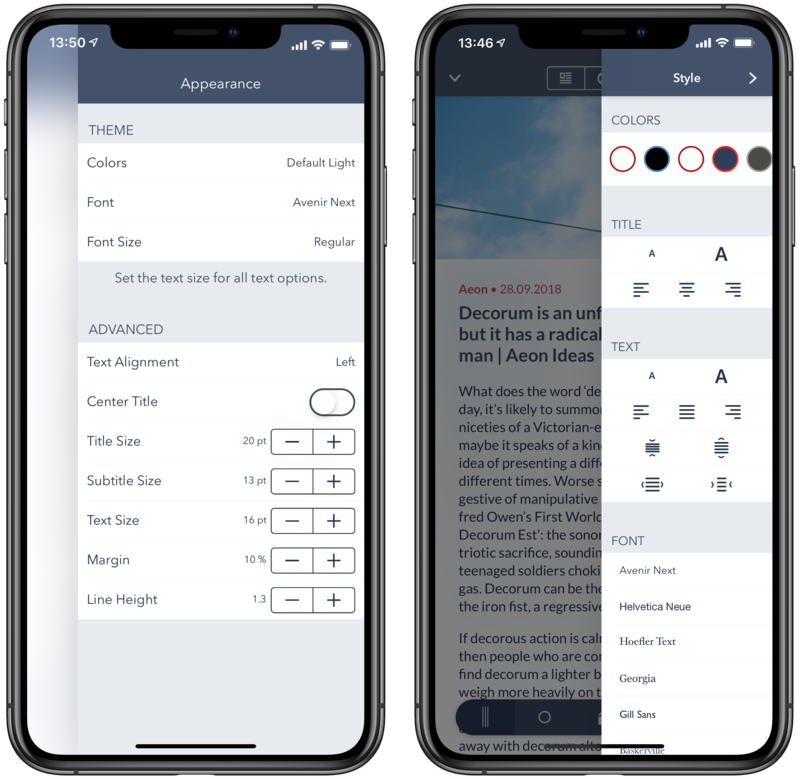 It started in version 2.0 with an improved layout, and was completed in 2.1 with completely redrawn icons and a ton of smaller interface improvements and polish across the entire app. 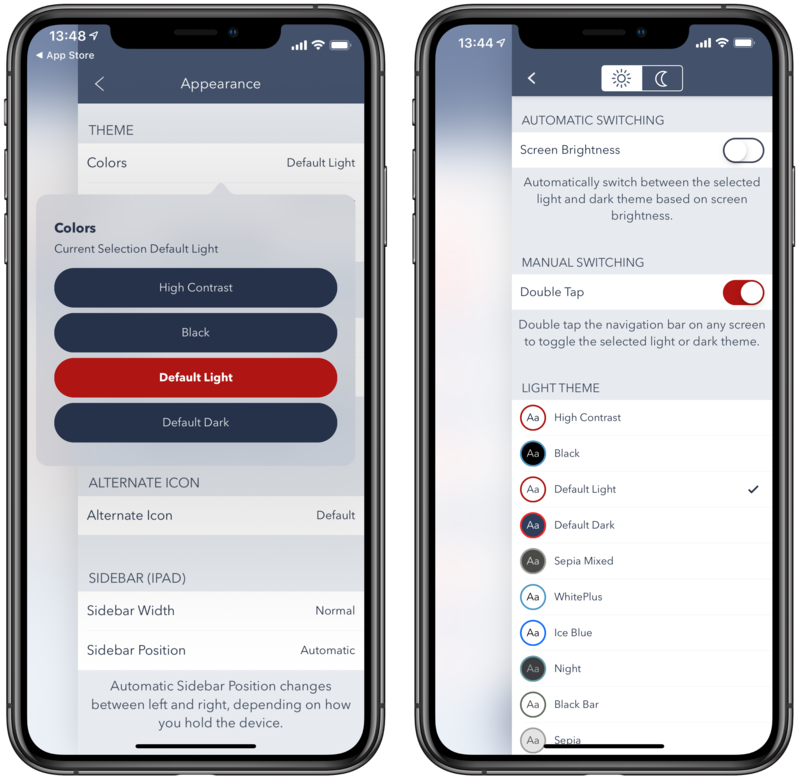 One of the most requested feature is automatic switching between a light and a dark theme. You can now select the dark and light themes of your choice, and switch between them either based on the screen brightness, or with a double tap on the navigationbar. A rather hidden features, but maybe my personal favourite are folder groups. 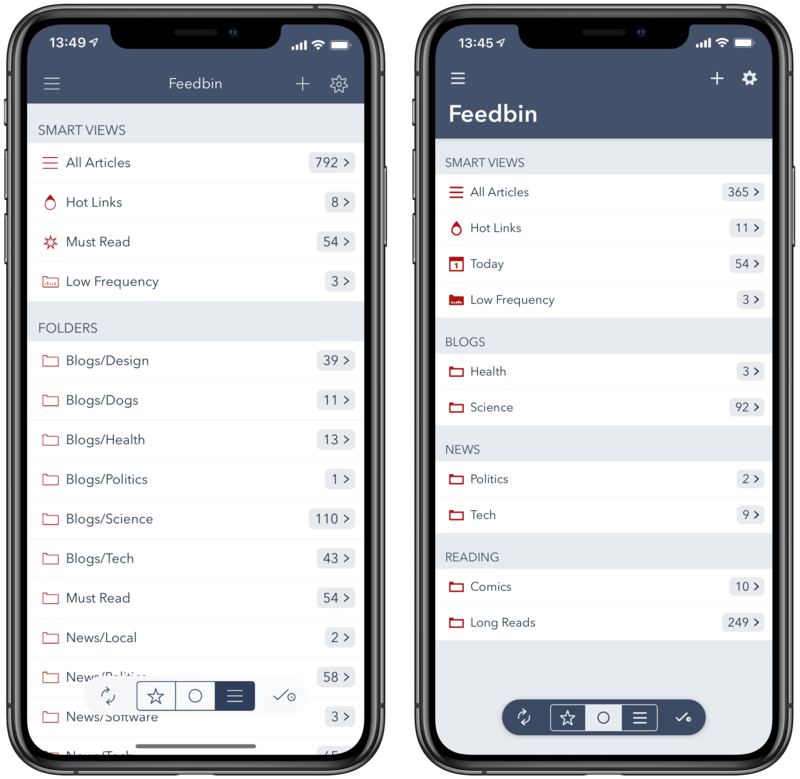 By naming feeds or folders in the form of “group/name”, they are grouped together in the feed list in Fiery Feeds, and because that name is synced to all your devices, these groups are automatically available everywhere. Additionally I’ve added full two way syncing for FreshRSS, a self hosted RSS reader, and Pinboard, as a new Read-It-Later Service in Fiery Feeds. Future plans are always subject to change, of course, but here’s the biggest feature I would like to add to Fiery Feeds next year (throughout two or three feature updates). More layout options, including a 3 pane layout, on larger iPads. This a more desktop-like layout, and it’s also a bit of preparation for an eventual Marzipan Mac app. Exactly what it says. An RSS account that’s not tied to any sync service or server. The app already supports the required feed management, but since that is a Premium feature, and a standalone account without the ability to add new feeds is rather pointless, the standalone account is likely going to be a Premium feature as well. Fiery Feeds already offers text extraction for any website, building upon that, a standalone read it later account shouldn’t be too hard to implement. Given that it also requires feed management, as well as text extraction, this is also going to be a Premium feature. Fiery Feeds has a lot of settings. To make it easier to manage them across multiple device, I’m planning to add iCloud sync for settings. 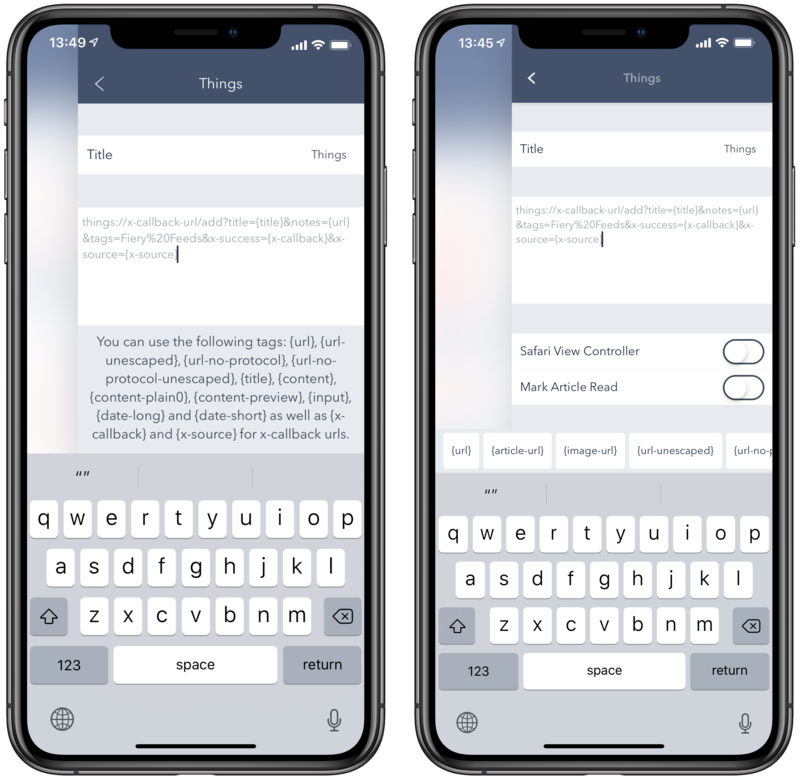 This includes all app-wide settings, as well as accounts (without login information though) and per-account settings, including article states in RSS accounts and saved links and states in read later accounts. Full Text search for articles in feeds, folders or the entire account. Search for options in settings. Support for searching articles using Spotlight. By saved searches I don’t mean just simple search strings, instead I’m planning something powerful enough to replace all current Smart Views (except Hot Links). That is, multiple parameters to include or exclude certain articles based on search strings, published date, article length and so forth. And finally, I’m waiting for Apple to release more information on UIKit on Mac, codenamed ‘Marzipan’. I’ve been meaning to do a Mac app for a while, but given that I’m a solo developer and time constraints, it’s simply not feasible to rebuild the entire UI in App Kit, but if I can reuse parts of the existing UI, that calculation changes. And I’m quite hopeful that it’s going to be possible to build a good Mac app using Marzipan, it is publicly available (after all, that’s more than a year of work on UIKit / Mac, compared to the current News and Home apps). Fiery Feeds is known to be very configurable, and there a quite a few settings to be found in the settings view. What is maybe less known, is that you can long press the settings icon, to open the Expert Settings, instead of the regular Settings view. 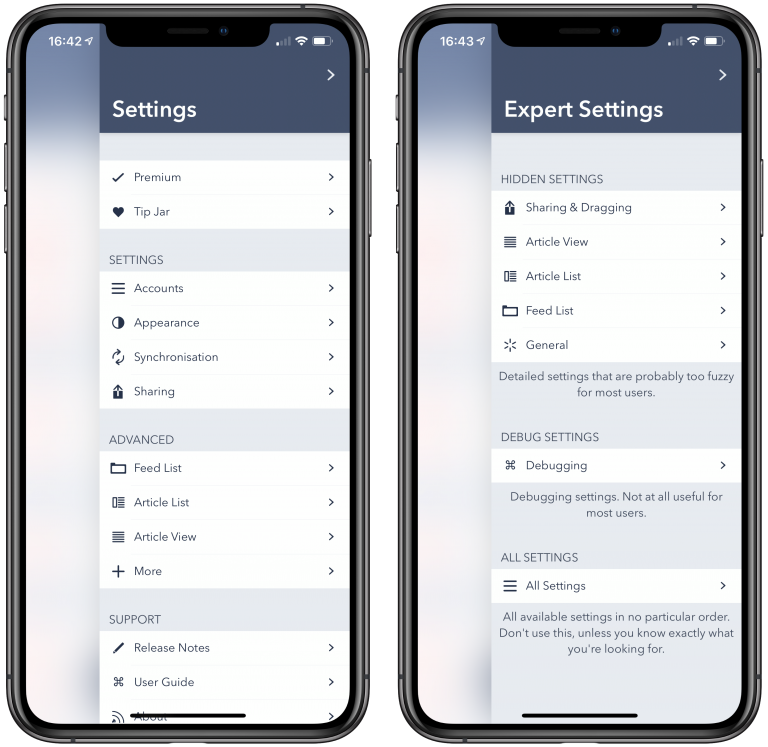 The Expert Settings screen contains a bunch of settings, that are not important enough to make it into the regular Settings view, since I don’t want to the settings screen to become unwieldy, with too many options, that hardly anyone uses. It also contains some more experimental options, that I might remove at some point later. The All Settings group simply lists all available settings in the app, unless you know what you’re looking for, this is probably not very useful to you. I want to highlight some of the more interesting options in the Expert Settings view. Share Full Text : This option allows you to share the full article text, instead of just the title, when using the system share sheet. Note that not all apps support this, and some apps will not show up in the share sheet, if this option is enabled. Open Web View Links in Safari View : Opens links clicked in an article in web mode in Safari View. Links opened from article or text mode are always opened in Safari View. This setting is disabled by default, since the web view and Safari View do not share their cookies, and it would be impossible to login to a paywalled website, if the login link opened in Safari. Article View Web Mode Reset Cookies : Automatically clears the cookies whenever an article is opened in web mode. Useful for some websites that only allow to view a limited number of articles. Zooming in Article View : Zooming in web mode is always enabled, this settings allows you to zoom in article or text mode as well. Article View Presentation : Open the article view fullscreen (default on iPhone) or small spaces left and right (default on iPad). Dynamic Height in Articles : Disabling this causes each article to use the exact same height in the article list. This increases performance, and might be easier to read for some, but it can leave empty spaces, if there is not enough preview text for some articles. Show Micro Blog Titles : Displays the blog name instead of the post title for titleless posts. This makes a list of microblog posts feel more like Twitter. On by default. Reduce Visual Effects : Removes a couple of animations, and visual effects like the blurred background in lots of places. Disabling can increase the performance, especially on older devices. Prefer AMP Pages : Shows the AMP page in web mode, if available. AMP pages are a lot faster to load, but this requires a call to Google’s repository of AMP sites before opening a website, which has privacy implications (it’s off by default). 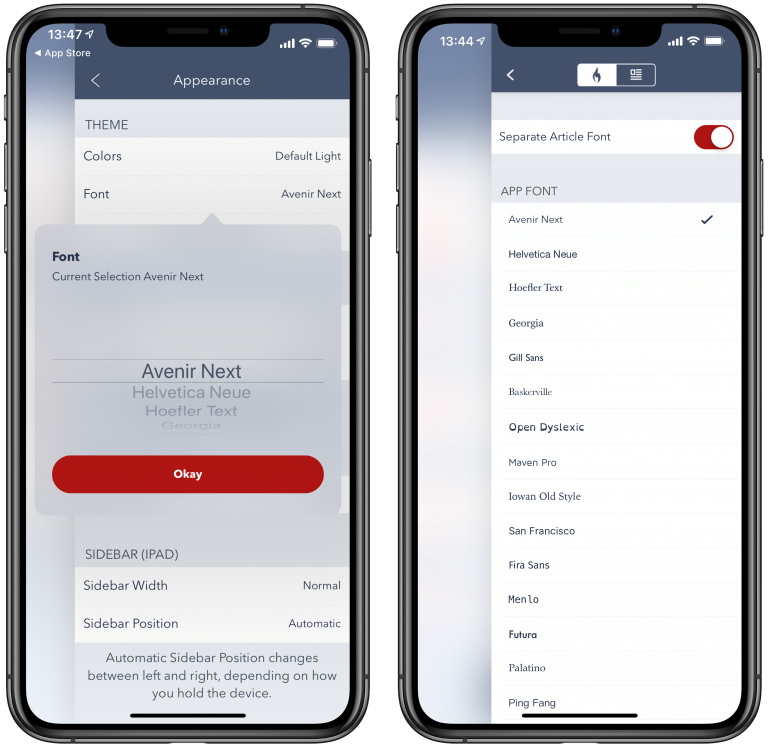 Version 2.1 adds a couple of new features, but the primary focus was on really polishing the design and making it feel right at home on iOS 12, after the layout and architecture changes in 2.0. There are three new smart views in this release. First there is the “Today” view, which simply shows all articles published today (this actually means this day, and not the last 24h period). If you look closely, you’ll notice that the today icon even shows the current date. Then there are the long and short article smart views, which show particularly long or short article, based on the word count. The exact threshold can be changed in the expert settings. Building on this there is now also the (per-account) option to display article word counts in the article list, which is especially useful for read-it-later accounts. 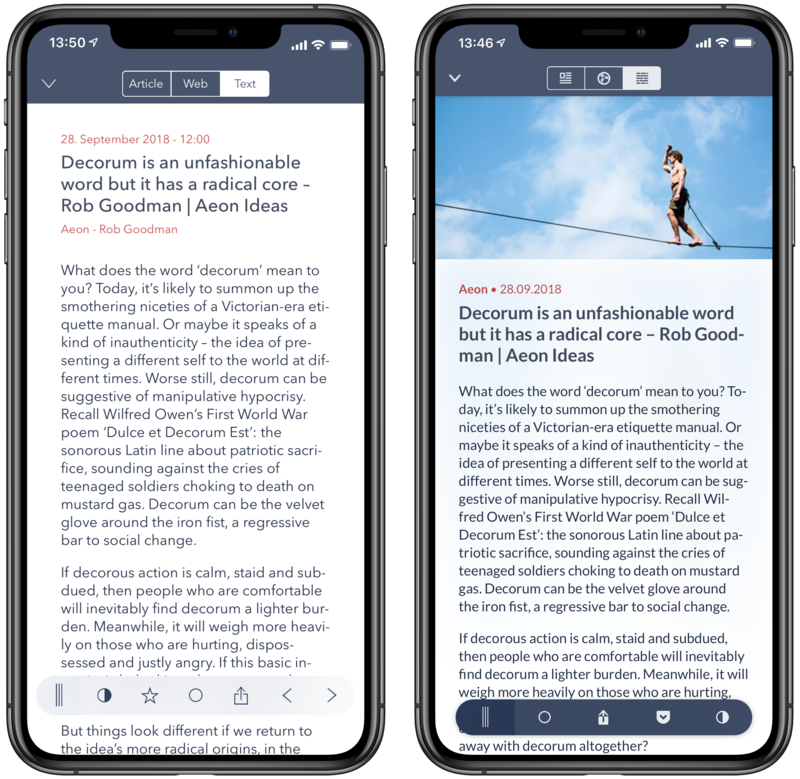 There is now full two-way sync support for Pinboard, it is primarily meant to be used as a read-it-later service, but Fiery Feeds still downloads all bookmarks. They are filtered by read / favorite status like all other articles though (Favorites are simply tagged with ★). There is also official support for FreshRSS, which just uses their new Fever style API, but uses the regular “All Articles” folder, instead of the Fever specific “Sparks” and “Kindling” folders. Siri Shortcuts for opening specific accounts. These shortcuts are available in the Settings.app > Siri & Search > All Shortcuts, Apple’s shortcuts app and they should appear automatically in the notification center and search view, if iOS detects some kind of pattern in your usage. You can now use the iCloud keychain or the new 1Password extension to fill in passwords when adding new accounts or sharing services. Fiery Feeds also fully supports the new iPhone XS Max. 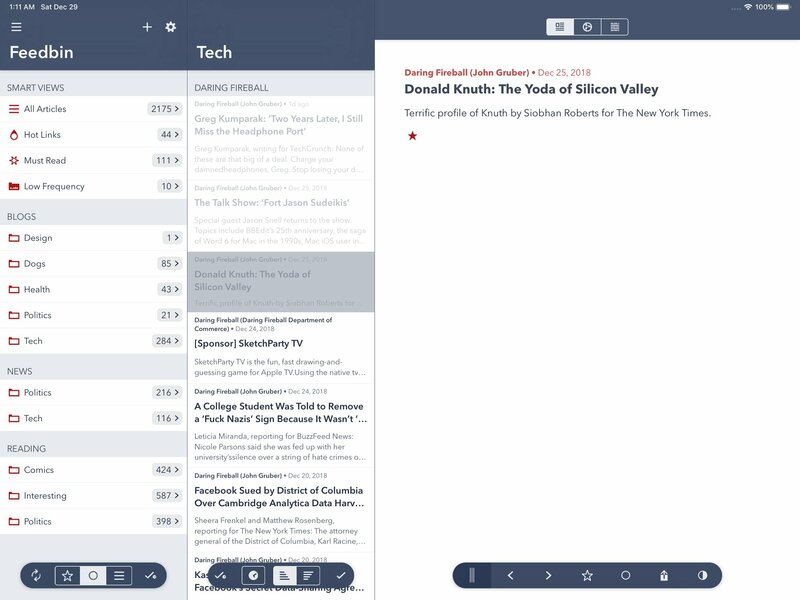 Not only is the splitview enabled in landscape, the individual entries now feature rounded corners, if there is some spacing required because of the notch. 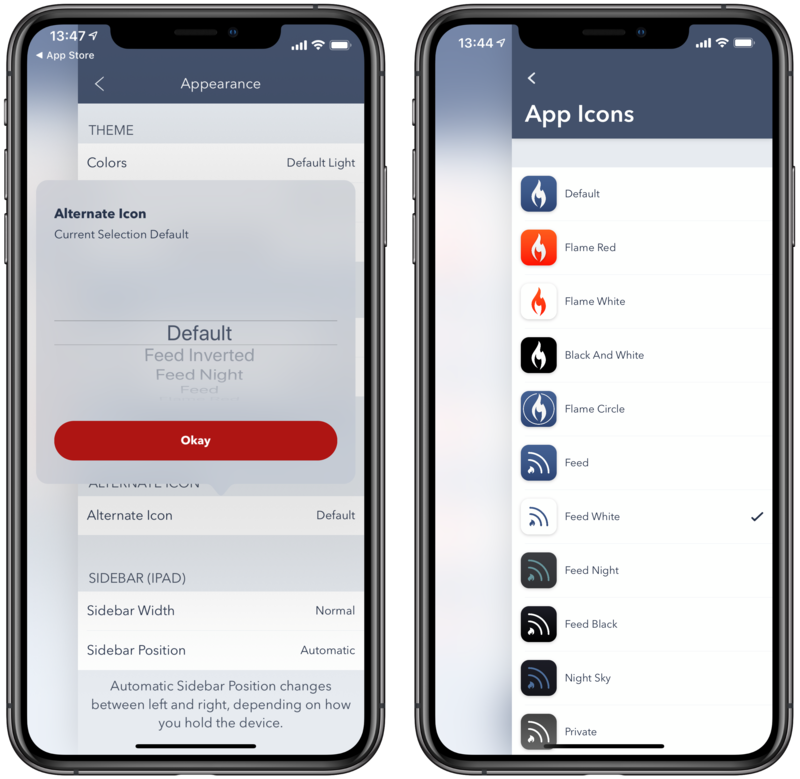 All icons in 2.1 have been redrawn for a bolder look that fits better with iOS 12. 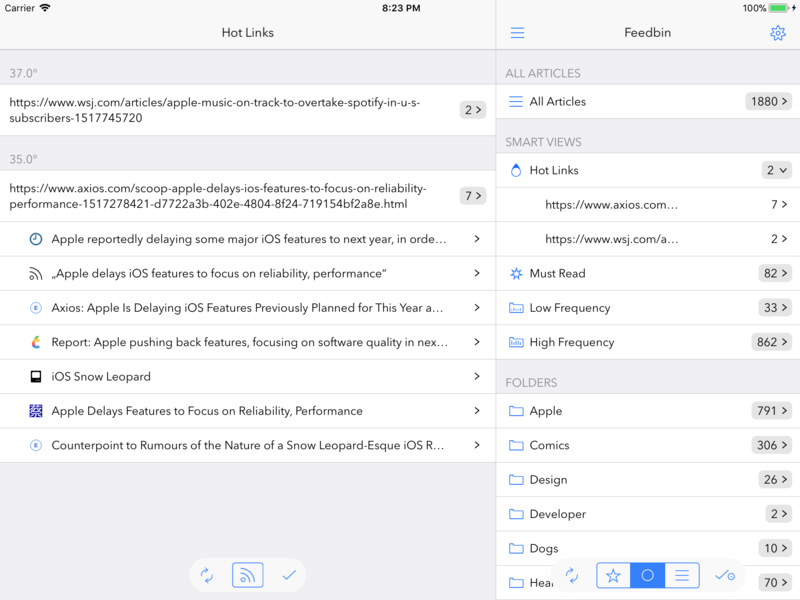 Fiery Feeds now also sports large titles like most system apps. You can now group your folders in the feed list and there is now the option to sort your feeds and folders by unread count instead of alphabetically. The article view now shows the main image as header image, and uses it as a blurred background, to give the whole article a bit of a tint. The rest of the article layout has been cleaned up, and the toolbar is now configurable by account. For example, read-it-later accounts now use a mark-read-and-close button instead of the standard read button, which feels much more natural. The article design picker has also been completely redesigned. It now takes less space, and you can see a live preview of your changes. (And it just looks a whole lot better). The Hot Links view has been much improved. Text versions of all hot links are now downloaded for offline use, and the found titles are used in the list view. 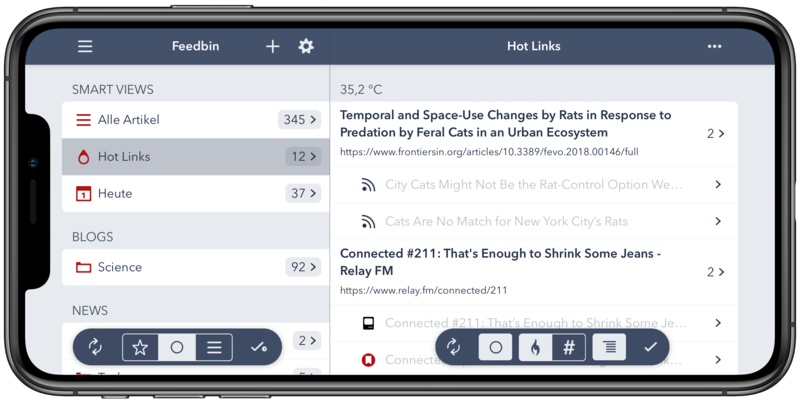 It’s now possible to sort the Hot Links by number of articles or by temperature. You can blacklist domains directly from the Hot Links list (or any other part of the url in the blacklist options). And filtering read articles now happens independent of the main list. Version 2.1 features a completely new theme picker. The main theme colors are now previewed. It’s easier to import themes from the directory or your iCloud Drive. It’s now possible to export themes by long pressing the theme you want to export and you can delete individual themes by left swiping on them. 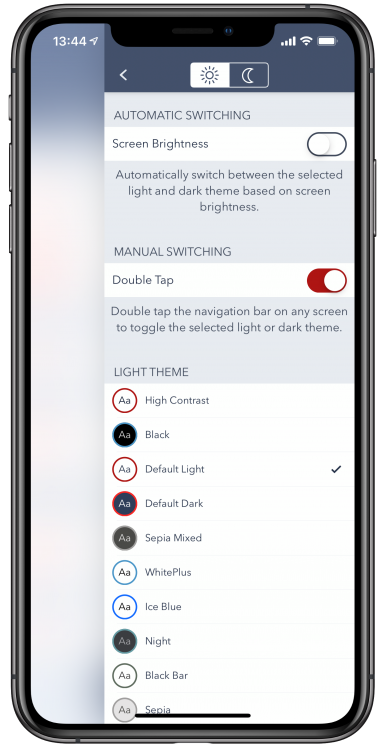 You can also now pick two separate themes as your dark and light theme. 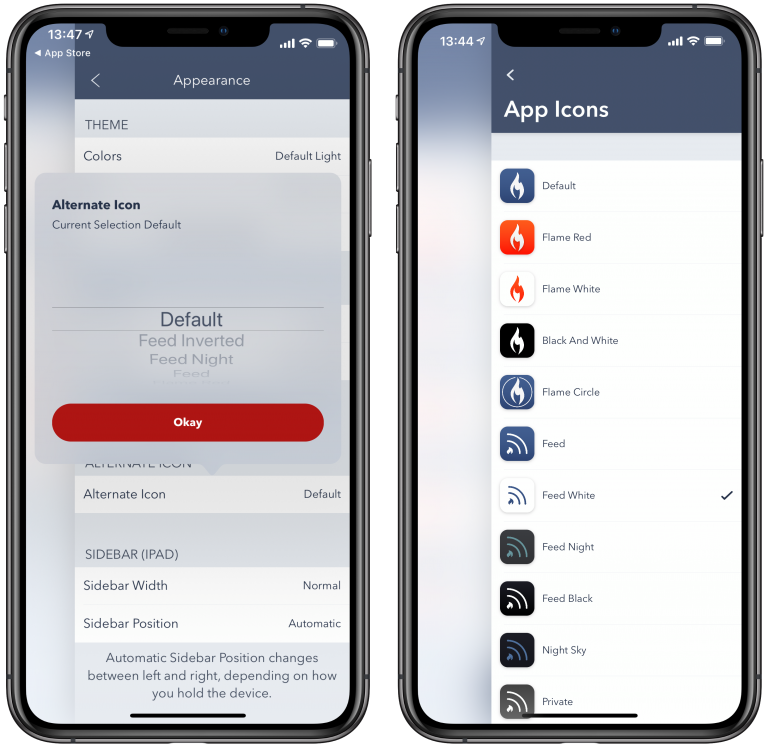 Fiery Feeds will switch between them either automatically based on the screen brightness or when you double tap the navigation bar on any screen. Like in the theme picker, the font picker also shows you how a font looks without selecting it first. You can now select a separate font for the article view and the rest of the app. There are also a couple new fonts available, including Futura, Palatino and Ping Fang (the first CJK font in Fiery Feeds). It’s now much easier to create your custom url actions and email templates. Fiery Feeds now has a bar with all available tags right above the keyboard, instead of just listing them in the footer below the textfield. The new app icon picker view previews the icons and there are a couple new icons, like the black and white icons, or the circle icon. 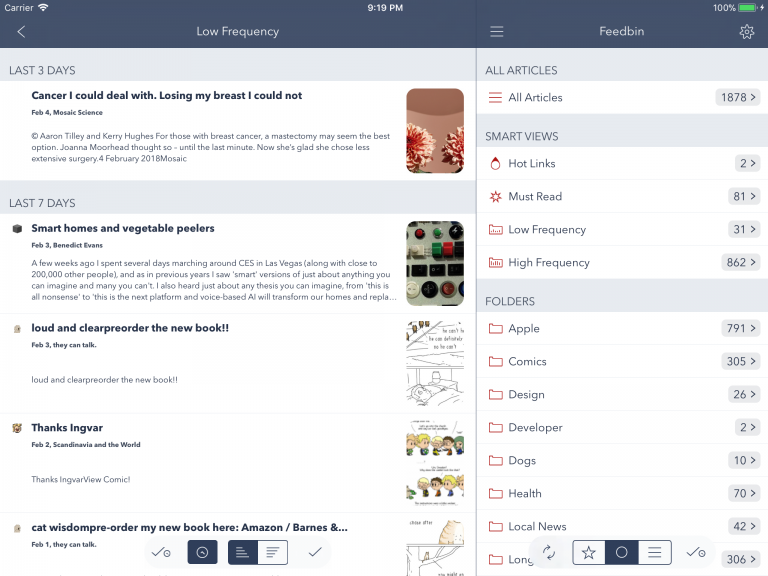 One of the new features in Fiery Feeds 2.0 are the Smart Views. I want to go a bit more into detail in this blog post. The big one among the Smart Views is definitely the Hot Links view. Fiery Feeds calculates as score for every link, the temperature if you will. This was inspired by the now defunct self hosted feed reader Fever. This temperature is based on both how many of your articles and feeds link to given website and how old these articles are. That means that the most important news are always on top, and cool down over time. Additionally links to the same domain are not counted, and it takes a least links from two different feeds to get a link into the Hot Links view. 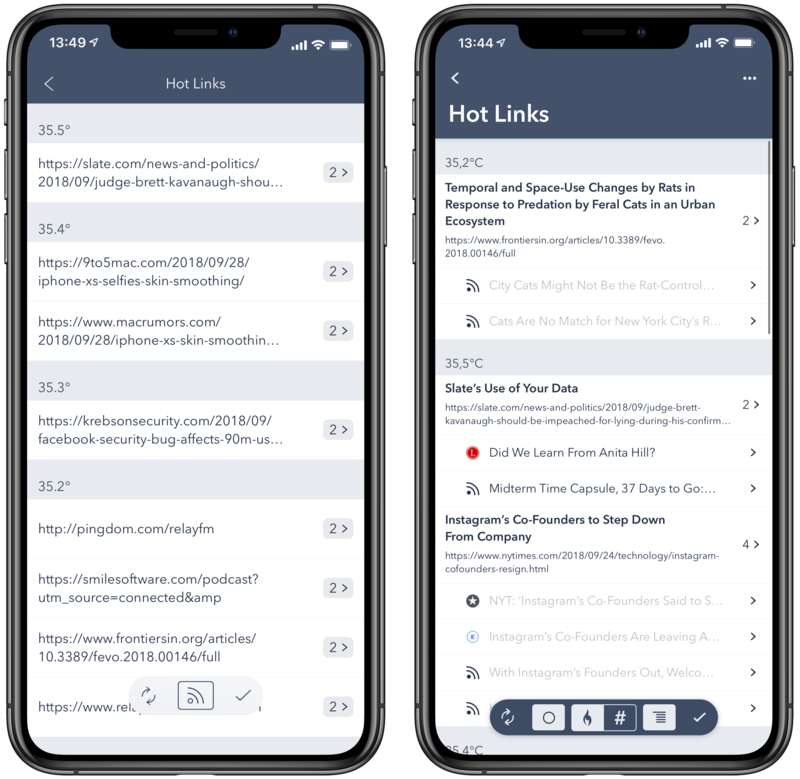 If you’re really into a specific topic, and subscribed to most of the important feeds, there is even an option in the middle of toolbar to limit the Hot Links to your articles. That is only links to any of your articles will be shown, and these links can are treated a little differently: Instead of the url the title of the article will be displayed. The Low Frequency view that shows only feeds that do not post often. 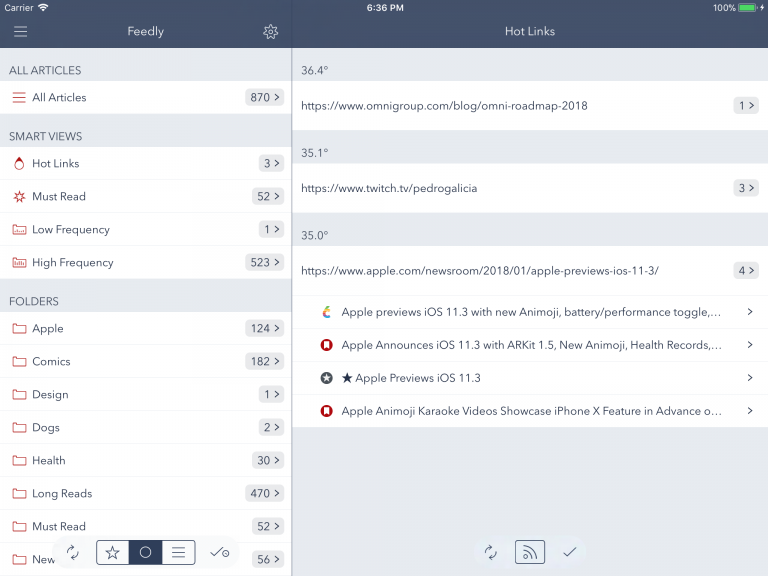 It’s akin to the Infrequent Stories feature recently launched by Newsblur, only that everything happens on device and that it’s available for all services. Most news feeds are always up to date and publish new articles whenever something happens. But then there are the blogs and authors, who post thoughtful pieces, but only post a few times per month. The Low Frequency view highlights these articles, by showing only article from feeds that post less than 0.1 articles per day, or one article every ten days. You can change this threshold in the new Expert Settings. The High Frequency view is the exact opposite of the Low Frequency view. It shows posts from all feeds that post more than two articles per day. (This too can be changed in the Expert Settings). You might ask yourself how this can possibly help catching up with your news. 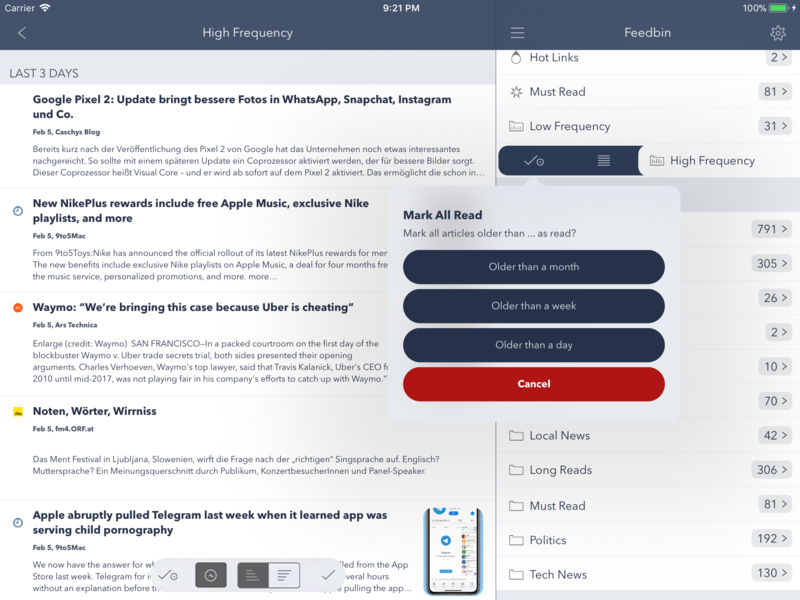 This folder allows you to mark old news articles read, and to get back to a manageable number of articles, without losing any of the articles from slower feeds. The Must Read folder is probably the least interesting thing in the Smart Views section: If you create a regular folder and name it “Must Read”, any feed in this folder will also be highlighted in the Must Read view. This view is not especially smart, but I find it really useful to have a couple of hand selected feeds at the top of the list. It means that when I finished the smart views section, I’ve already read all of the important stories of the day. © 2014 Lukas Burgstaller. All Rights Reserved. iPhone, iPad, iPod and Mac are trademarks of Apple Inc. Impressum.